Whether you are a main contractor, a specialist subcontractor, a supplier or a consultant, The Builders’ Conference has something for you. Including exclusive offers for our Members. If you are looking to forecast market trends, their data of regional and sector statistics will be invaluable. If you want to find new work and monitor project awards and tenders, their portal will keep you up to date. Please do check their website for more information on the comprehensive service and packages available. 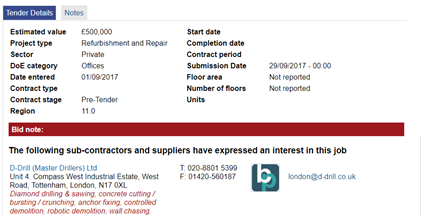 Courtesy of Builders’ Conference, our Premium Members receive a ‘pre-tenders reported and contracts awarded data bundle’ worth £250. In addition, they offer Premium Members a free trial to their online portal. You’ll be able to source jobs available in the areas you work and express your interest directly. Basic members who are already Builders’ Conference members can claim a discounted offer towards the cost of Builder’s Profile Premium Membership.